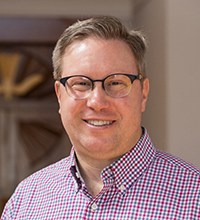 (Chip) Hardwick (’99, ’07 PhD) has served as the director of theology, worship, and education for the Presbyterian Mission Agency of the Presbyterian Church (USA) since January 2012. An ordained PCUSA pastor, he most recently served as pastor/head of staff of Second Presbyterian Church in Bloomington, Illinois, a congregation of 1,700 members. He previously served a new church development outside of Princeton, New Jersey; the North Avenue Presbyterian Church in Atlanta, Georgia; and congregations in New York City, London, England, and Madrid, Spain. He has a BA degree from Alma College, an MBA degree from the Kellogg School at Northwestern University, and a ThM degree from the Candler School of Theology at Emory University.